Risk Assessment | Pinnacle Systems Inc.
Risk assessment is used to determine the level of danger to an individual and select appropriate safeguards to reduce or eliminate the risk. Industrial machines present numerous hazards on the plant floor. Hazards include, but are not limited to, mechanical processes that crush or shear, pinch points, stamping and bending of metal. The method of safeguarding must take into account both the likelihood of injury occurring and the severity of the resulting injury. OSHA and ANSI regulations provide safety standards for machine guarding and personal protective equipment to mitigate the probability of harm occurrence. Implementation of safety devices can be achieved without diminished performance of the manufacturing process. The goal of the safety program is to protect workers and factory processes from injury and disruption in productivity caused by accidents. Risk reduction begins with a thorough preliminary hazard analysis or safety survey. Each machine is examined for potential problems and the presence of existing safety control systems. A loss prevention program is then developed to comply to safety standards while preserving plant efficiency. Protection levels may vary at each machine based on the associated danger. The Best Safety Practice (BSP) is employed to meet with government standards. Common safeguards include: lock-out/tag-out, fail-to-safe systems, continuous self-checking, emergency isolation devices, channel monitoring and system redundancy. Once risks and present safeguards are identified and loss prevention implemented, safety monitoring remains an important part of risk management. Pinnacle Systems provides complete risk assessment, solution implementation and system monitoring resources and equipment. 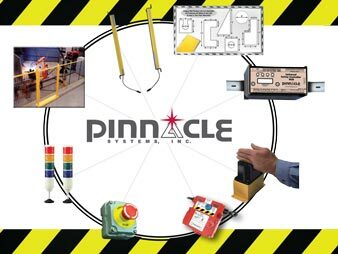 To request more information or an on-site risk assessment, send an email to risk@pinnaclesystems.com or call (800) 569-7697.